I first heard the teaching about tithing when I was 16 years old. The way it was explained was that tithe is 10 percent of one's income. The question was should I give 10% of my net income or my gross income? When I went to Bible school, I had a teacher told us in class that we should tithe only the net and not the gross income. When I went to seminary, I had a professor told us that tithing is not a New Testament command but an Old Testament law. While this statement shocked me, I continue to tithe nonetheless. Sometime in August 2010, a Wesleyan pastor from the US conducted seminar on stewardship for our Cambodian pastors. By this time, I was already 7 years missionary in Cambodia. Our guest didn't believe that tithing as being taught in most churches today is biblical. He also criticized strongly our system in the church by which we deduct the 10% tithes of the pastors whenever they receive their support. He said, "Don't call it tithe; call it tax"! Removing the pastors' tithes immediately was a tax not tithe because we did not give the pastors opportunity to give their tithes freely. That was shocking to me. The most comprehensive study about tithing I've ever read was written by Russell Earl Kelly. You will find his video and article in the bottom of this page. You can listen to the video or read the article. I will be crucified in saying this but I say it anyway: his writing, based on thorough study of the Bible, convinced me that tithing is not a Christian doctrine. Attacking the teaching on tithing in the church does not mean we should stop giving! Generous giving and sacrificial offering should replace the unbiblical teaching of tithing we hear in many churches today. The pastor should not worry about not having enough money because generous and sacrificial giving should take care of all the needs in the church, but it pastor's support, outreach, missions, etc. Here are some shocking facts about Tithing. I have never heard some of these facts in my more than two decades of living the Christian life and my more than 17 years as pastor/teacher. My guess is that some of you haven't heard/read either. 1. Tithes in the Bible was always only FOOD from inside Israel. There are only 16 references about the Holy Tithes from Leviticus to Luke and it was all about FOOD and never money. Rusell Kelly listed 6 points about biblical tithing. (1) only food, (2) only from the farms and herds, (3) of only Israelites, (4) who only lived inside God’s Holy Land, the national boundary of Israel. (5) only under Old Covenant terms and (6) the increase could only be gathered from what God produced. 2. Money was not Tithed-item in the Bible. Money existed in the OT but it was not a tithable item. Kelly writes, "Clean wild game animals and fish could not be tithed; (3) non-Israelites could not tithe; (4) food from outside God’s holy land of Israel could not be tithed; (5) legitimate tithing did not occur when there was no Levitical priesthood and (6) tithes did not come from what man’s hands created, produced or caught by hunting and fishing." 3. There are four tithes in the OT; 3 are religious-Levitical tithe, Feast tithe, and Poor tithe. Kelly writes, "The whole first tithe was given to the Levites who were only servants to the priests (Num 18:21-24; Neh 10:37b). The Levites, in turn, gave one tenth of the whole tithe to the priests (Num 18:25-28; Neh 10:38)." If you read the text in Deu 12:1-19; 14:22-26 will be amazed that the feast tithe is to be eaten by the people. Of course the tithe for the poor is collected for the poor (Deu 14:28, 29; 26:12, 13). Again the tithe is only food not money! 4. Levitical tithes were usually taken to the Levitical cities where 98% of the Levites live. The whole tithes NEVER went to the Temple. Normally only Levites and Priests bring tithes to the Temple. The Levites or the servant of the priests who are prohibited to own a land receive the first tithe. As a matter of fact, the priest never receive the first tithe. They only receive 1 tenth of the whole tithe from the Levites. It is another yet wrong principle to require the church today to give tithes to the pastors and yet the pastors own house and land. 5. Tithes in Malachi 3: 10 is plural, not singular; meaning it includes the whole four tithes in the OT. This is the most abused text in the Bible about tithing. The context tells us that the rebuke is given to the dishonest priests and not the people. Because the context relates to the priest-thieves, the storehouse here might refer to the small storehouse in the temple Nehemiah 13:5, 9, but it must include the storehouses in the Levitical cities outside Jerusalem where 98 percent of Levites live. Therefore, the teaching today that tithes should be brought to the local churches is wrong principle. Read this article more about on Malachi An Exhaustive Examination of "Tithe," "Tithes" and "Tithing"
6. In the OT the poor did not tithe, in fact they received tithe. It is not a principle to require everyone to give 10 percent. Perhaps just 1 percent for the poor is already too much and 10% for the rich is too little. 7. Tithing in the New Testament is not taught to the church after the death and resurrection of Jesus! "There is not a single New Testament Bible text which teaches tithing after the cross!" In other words, there is no command in the New Testament that the Jewish Christians or even the Gentile believers should give their tithes. 8. John Calvin, Martin Luther, Charles Spurgeon, John Bunyan, John Wycliffe, Adam Clark, Campbell Morgan, Oliver Cromwell, and others believe that tithing should not be taught in the churches. My conclusion is, just because most churches and famous pastors and evangelists throughout the world teaches tithing does not mean tithing is part of the New covenant. Do your own homework. 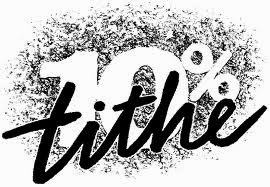 Please read the comprehensive article about TITHING here: Should The Church Teach Tithing?